Beginning May 1, The Bronx Museum of the Arts will present Shyu Ruey-Shiann’s kinetic installation One Kind of Behavior at its North Wing second-floor terrace. With dozens of same-sized steel buckets scattered on the floor, One Kind of Behavior will transform the spacious terrace into a vibrant, playful and intriguing landscape. It will be on view through August 17, 2014. Upon entering the terrace, one's auditory perception is immediately stimulated by the sound of clashing metal. Random reverberation captures the space. Viewers are greeted by dozens of metal buckets, each undulating to its own unique rhythm. Shyu works with different material and media to explore themes related to our environment. The installation One Kind of Behavior is inspired by the quasi-mechanical movements of creatures like hermit crabs. The artist sees within the landscape of nature, languid movements of opening and closing of the hermit crab's shells, a stark contrast to contemporary society where things move at high speed. The fact that hermit crabs occupy shells discarded by other species is another source of interest to the artist, who sees in this special relationship a metaphor for our human condition. Contrasting man and animal behavior, One Kind of Behavior asks us to consider our environmental and the consequences of our actions on nature. Shyu Ruey-Shiann was born in Taipei, Taiwan, in 1966, currently lives and works in New York and Taipei. Shyu is one of the pioneering artists in Taiwan’s contemporary kinetic art movement. In the first ten years of his art education Shyu focused on academic western paintings and sculptures. In 1993, he began his studies at Aix-en-Provence Art College, in the south of France. His interest in man-made objects and mechanical movements in this period led the path to the exploration of non-traditional media and machine-oriented art. When he returned to Taiwan in 1997, endowed with hands-on knowledge of modern art and contemporary theory, kinetic art became the cornerstone of his creativity and the chosen language in expressing his visions on life, memory, and issues on social and political concerns. Shyu has received many awards including the Taipei Award from Taipei Fine Arts Museum; the Creation Awards from Lee Chung Sheng Art Foundation; the YageoTech-Art Award from the Asian Cultural Council of New York; and the Public Art (Excellence) Award, Taiwan. Shyu’s work has appeared in numerous museums and galleries worldwide, including National Taiwan Museum of Fine Arts, Taichung; Location One, New York; Stone Villa, Sydney; Kaohsiung Fine Arts Museum; Museum of Contemporary Art, Taipei; Hong Kong Arts Center; Perth Institute of Contemporary Arts, Australia; Eslite Art Gallery, Taipei; Taipei Fine Arts Museum; Centre d’Art et de Plaisanteire, Montbéliard, France. A documentary film “Making Techno Art out of Rubbish—Shyu RueyShiann” focuses on Shyu’s art career, life and families, was made by director Huang Mingchuan and published by Taiwan Public Television in 2006. The Bronx Museum of the Arts is an internationally recognized cultural destination that presents innovative contemporary art exhibitions and education programs and is committed to promoting cross-cultural dialogues for diverse audiences. The Museum plays a vital role in the Bronx, making art accessible to the entire community through its universal free admission policy and connecting with local schools, artists, teens, and families through its robust education initiatives and public programs. 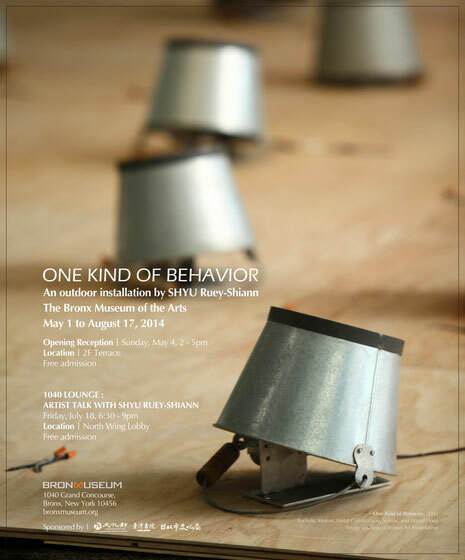 Join us for a lively interview and Q&A with artist Shyu Ruey-shiann, whose exhibition One Kind of Behavior is currently on view through August 17 at the Bronx Museum. Presented by the Bronx Museum Community Advisory Council. Although the basic component in my work is machined-driven, within its complexity, I seek the simplicity of a visual language. Technology is merely a means of transcending mathematical precision to achieve something more abstract, a dialogue between machine and human intention, that offers possibilities of meanings and something more personal. In this sense, i hope to express the poetry and spirituality of everyday life. CityScape is an exhibition that examines the development of modern cities and its adverse effects on the environment and humanity as a whole. A micro cityscape is conveyed on the third floor of the exhibition with a series of miniature architecture models, above which a gigantic tunnel shield perforates the wall, signifying the proliferation of underground development in urban areas. Similarly, a model of the highway overpass column suggests no less the vicious cycle prevalent in such urban development. The installation on the second floor is more low key and introspective. A banyan tree installed in the corner of the room provides calm and peace, in contrast to the visual overload and violence of developing urban landscape. Chinese American Arts Council / 456 Gallery invites you to the exhibition Unfinished Journey: An On Going Project by SHYU Ruey-Shiann, from May 30th – June 25th, 2013 with an opening reception on Thursday, May 30th, from 6-8 PM. “Unfinished Journey” is a new “in-progress” exhibit at the 456 Gallery by SHYU Ruey-Shiann, who is known for his kinetic art. To SHYU Ruey-Shiann, travelling has always been a matter of progression – starting from zero to infinity and then returning to zero. Such is the cyclical state of the universe, life and art. With this concept, this exhibit will show a series of “unfinished” drawings of New York City and one improvised kinetic sculpture that SHYU Ruey-Shiann will create on site. This improvisational piece will began in a bare state and then continuously progress as time goes. Its final state is unknown. 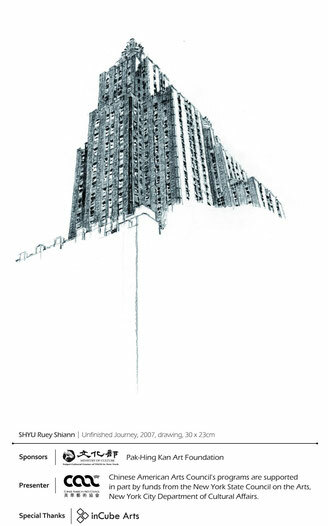 SHYU Ruey-Shiann began this New York City drawings series at the end of 2007 and continuing until now. Considering this to be an “unfinished Journey,” SHYU Ruey-Shiann says “even as the series began, it meant there would not be an end as life is too short for one to record every corner of this magnificently energetic city. One can only record what he sees as best as he could. Behind every building there is a unique story – from the past to the present, from concrete sense to abstract ideas.” While without the tools to create his kinetic art, SHYU Ruey-Shiann often walked the streets of New York with just a pencil, sketching the lines of these building. He is never too concerned about drawing an exact representation of the buildings. Rather, these illustrations show only parts of them with much whitespaces on the page, which creates a sense of unknown and mystique. “Unfinished Journey” - SHYU Ruey-Shiann is still continuing this never-ending journey. 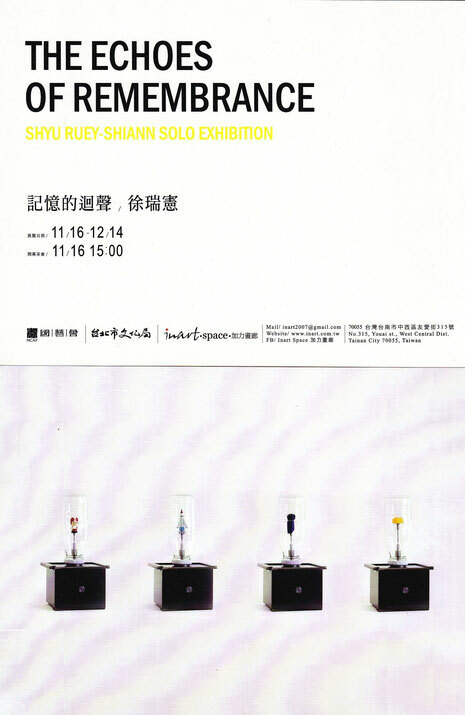 SHYU Ruey-Shiann is one of the premier pioneering artists in Taiwan’s contemporary kinetic art movement. In the first ten years of his art education, SHYU Ruey-Shiann focused on academic, traditional western paintings and sculptures. In 1993, he began his studies at Provence Academy of Art in the south of France. During that time, he came to understand a wide variety of creative methods and materials among which include – steel, machinery, and kinetic - ones that most influenced him until today and initiated his path to create kinetic art. Since SHYU Ruey-Shiann returned to Taiwan after graduating from France in 1997, kinetic art has become his relentless, self-challenging pursuit as well as a stylistic and unique language of his. 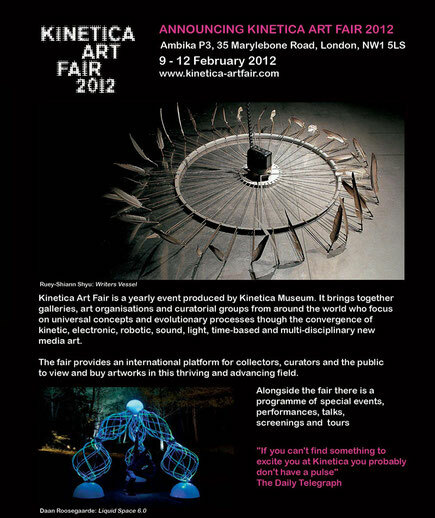 In recent years, SHYU Ruey-Shiann has frequently been invited to participate in international exhibits, including the 2011 Kinetica Art Fair in Ambika, London, solo exhibitions at the Taipei Fine Arts Museum, the 2013 ISE Foundation in New York, and the White Rabbit Gallery in Sydney, Australia. 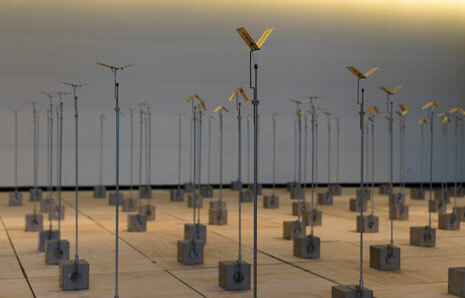 Currently, SHYU Ruey-Shiann’s large-scale kinetic installation, “Traveler’s Wings,” which has garnered widely positive critical reviews, is being exhibited at the National Taiwan Museum of Fine Arts and the National Art Museum of China in Beijing. 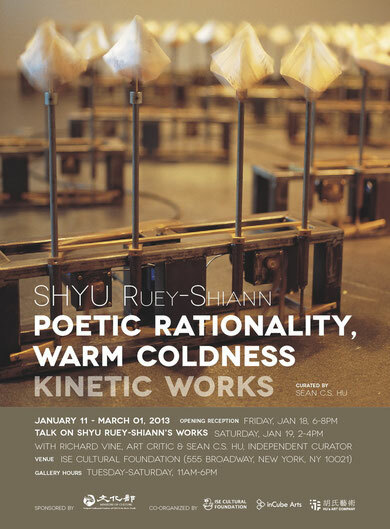 ISE Cultural Foundation is pleased to present solo exhibition "SHYU Ruey Shiann: Poetic Rationality, Warm Coldness", curated by Sean C. S. Hu. Poetic Rationality, Warm Coldness is an exhibition of three kinetic artworks created in different stages of time by Taiwanese artist, SHYU Ruey Shiann, and they are Life and Death, River of Childhood, and Trace. Through the exhibition, an opportunity is presented to the audience to understand the artist's creative context and concepts and to get a glimpse of his internal world and his dynamic creative aesthetics. SHYU is known for his art created with mechanical elements. He uses his hands to turn complex mechanical concepts and installations into simple and concise artistic expressions, as cold hard industrial materials are transformed into abstract and warm three-dimensional sculptures. Binary contrasting relationships, such as rigid/soft, cold/warm, rational/emotional, give SHYU's art a dynamic and conflicting power that is also touching and poetic at the same time. 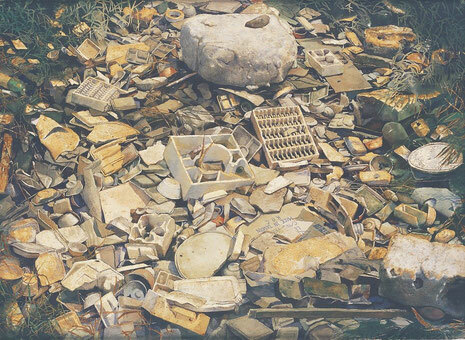 The artworks included in this exhibition distinctively represent the artist's concerns for the nature and our environment and also his nostalgic recollections of childhood memories. 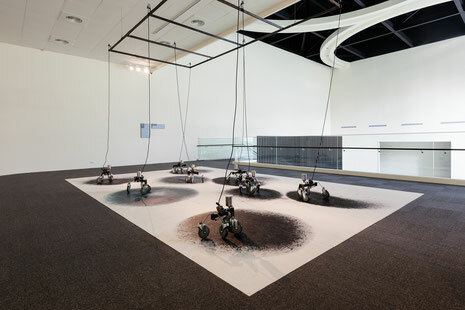 With the machines' slow movements, the artworks resemble old gramophones or time machines that are able to transport us back to beautiful times in the past, as a sense of resonance echoes in life's shared experiences. Life and Death is the first artwork the audience encounters at the exhibition, and with this simple installation, the artist intends to express the idea that all living beings on Earth are equal and human behaviors have caused drastic ecological changes; before the extinction of more life, please protect and respect the world we all live in. The second artwork, River of Childhood, is an installation of small boats. The electric current guides the audience on an expedition back in time to search for nostalgic memories. While reminiscing the changing sceneries before us, we are prompted to question whether the progression of time has taken away our original hopes and dreams? With the last artwork, Trace, the moving charcoals of the piece appear to be dancing and swinging, and with each stroke and line, traces are left behind as marks of time. Just as time has also inadvertently left its traces in life, from which, an internal landscape of the self is thereby formed. 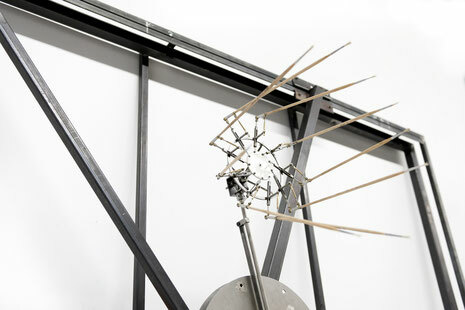 SHYU Ruey Shiann is one of the important pioneers in Taiwan's contemporary kinetic art. He uses machines to express emotional burdens and little by little recounts reflections he has for life and nature, as new significance is given to the medium of metal. SHYU gained recognition from the art world in France during the time he spent there in the 90's. In 1997, he was the first place recipient of the French National Senior Diploma in plastic expressions. In the recent years, he is frequently invited to participate in international exhibitions, including Kinetica Art Fair in Ambika, London, Lunarfest in Harbour Front Centre, Toronto, and Tenri Cultural Institute, New York. In 2012, SHYU was invited to present his solo exhibition, Distant Rainbow, at Taipei Fine Arts Museum, which received many positive critical reviews. Rainbows are where stories begin and are in everyone’s dreams. SHYU Ruey Shiann relies on many years of experience and intuition to transform and reorganize objects he has collected since childhood, blending new technology into old stories to create a subtle mix. Like a poetic rendition of waking from a dream, his mechanized installation slowly reveals memories of childhood wishes. His work The Edge of Memory is presented on a moving swing, his Dreambox contains spare parts from a model motorcycle, Afternoon Rhapsody is made from a rocking schoolroom chair-desk, and Mom's Drawer incorporates a drawer and is based on memories of the artist’s mother. The artist also uses light, sound and smells to elicit the enduring rainbow hidden within. A work of art may be composed of a single or hundreds, to thousands of different components; yet, despite this massive complexity, Ruey-Shiann Shyu aims to create visually, an impression of simplicity. Through various rhythms which are based on precise mechanical theories that result in a type of ‘poetry in motion’, Shyu tells stories from his own cultural background. Shyu views the absolute precision of mechanical movements as an abstract language. This abstract language conveys a living philosophy, which transcends the visual image of the work. He uses mechanical elements both as a creative media and as a deeper exploration of the meaning of life. Artistic creation makes it possible for machines to be infused with living energy through the rhythm created from the combination of precise components and repetitive mechanical motions. The use of mechanical elements both as a creative medium and as a deeper exploration of the meaning of life means that Shyu’s machines are infused with living energy. Writer’s Vessel is a group of quills, arranged circularly into a mechanical ring, which during its circulation, moves the quills in such a way, that creates as it were, an impression of a visual poem, representing the writer’s magical stream-of consciousness, as a way of the art of knowledge or the art of writing, and the movement caused by the writer’s energy of mind and body. Tenri Cultural Institute, 43A West 13th Street, in NYC is delighted to present the solo exhibition Journey: Rueyshiann Shyu from November 4-29th, 2011 with an opening reception on Friday November 4th, from 6-8PM. documents objects through time and space; it explores the nature of life and death. 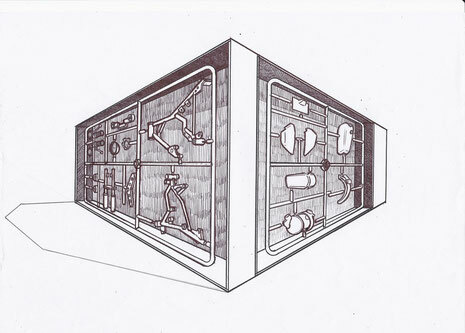 In this exhibition each story is constructed using hundreds or even thousands of mechanical components. Their basic movement is circular, like the journey of life. Through the change of structural links, it creates the interplay between the motion and object, lays down an abstract landscape of memory and breathes life into each story. Artists have struggled since the 19th century to overcome the static nature of sculpture and painting. As seen in Degas’s dancers and horses, he signaled movement by using pentimenti in parallel strokes by their legs. This element was also evident in Matisse’s dancers. Boccioni and the futurists attempted to produce dynamism in their works by using repetitive line but it wasn’t until actual moving sculpture was invented that artists were successful in reaching their goal. The history of kinetic art reaches back to Duchamp and his readymade Bicycle Wheel, 1913 whose single wheel was secured atop a kitchen stool. Duchamp was interested in the accidental effects of movement as opposed to Shyu’s painstakingly created pieces whose very motion is studied. The Constructivists Naum Gabo, Antoine Pevsner, as well as the Bauhaus artist Laszlo Moholy-Nagy and the American Alexander Calder created kinetic sculptureas early as the 1920s. 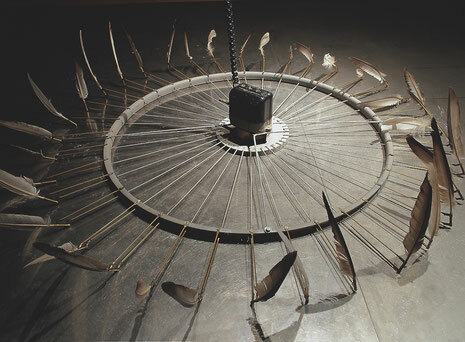 Today kinetic art has incorporated sophisticated digital technologies, as well as light and new mechanical methodologies that drive sculptures via wind power, the principle of equilibrium of weights, etc..
Shyu has been working with kinetic sculpture and mechanic installation since 1997. The artist explores the nature of dynamic movement through the use of precision and complexity to create works that challenge the viewer but that also touch the human heart with narratives from his own Taiwanese cultural background. His materials and working methods combine to result in artistic creations that explore the very nature of life. Shyu has exhibited extensively at prestigious venues around the world, and his works appear in numerous public collections worldwide, including: The National Taiwan Museum of Fine Arts, Taichung; Chelsea Art Museum, New York; Taipei Gallery, New York; Location One, New York; Stone Villa, Sydney; Kaohsiung Fine Arts Museum; Museum of Contemporary Art, Taipei; Hong Kong Arts Center; Perth Institute of Contemporary Arts, Australia; Eslite Art Gallery, Taipei; Taipei Fine Arts Museum; Montbeliard, France. FOR MORE INFORMATION: Please contact Tenri Exhibitions Director Dr. Thalia Vrachopoulos, tvrachopoulos@gmail.com, or call 212-691-7978 or the Administrave Director Michael Yuge at yuge@tenri.org or call 212-645-2800.